Drive Dealership Profitability & Growth by Speeding the Process from Auction to the Lot - Cox Automotive Inc.
On average, it takes upwards of 11 days to get used inventory frontline-ready, but the top 20% of dealers are accomplishing these tasks in less than 4 days. These dealerships are best positioned to sell the most vehicles in today’s marketplace, where the car-shopping process can be swift. 61% of the car-buying process is spent online and only 21% of the process is spent with the dealership where customers make their purchase, indicating that most car buyers are making purchase decisions online. Therefore, it is vital that dealerships get the right inventory online – in their virtual showrooms as well as their physical lots – as soon as possible. Speeding the transport phase of the wholesale-to-resale process can also boost overall operational profitability by reducing vehicle holding costs. Centralizing transportation can result in an approximate 60% reduction in the amount of time it takes to get vehicles from the auction to the dealership. Infusing speed and efficiency into the wholesale-to-retail process — from inventory identification, acquisition and floor-planning to inspection, transportation and merchandising — is not only a way to increase inventory turn, but it’s also a particularly effective and increasingly necessary way that progressive dealerships can help overcome margin compression. Selling more vehicles at a faster rate rather than maximizing gross per unit. An analysis of economic trends indicates that now may be a desirable time to invest in solutions for speeding the wholesale-to-retail process. The automotive industry has a general tendency to run in 10-year peak-to-peak and trough-to-trough cycles. In the last 35 years there has been only one exception: the early 2000s, when many consumers likely relied on home equity to continue purchasing vehicles. Otherwise, dealers who weathered the financial crisis of 2008 are likely familiar with not only the cyclical nature of vehicle sales, but also the need to adapt to survive. Looking at the long-term pattern of peaks and valleys in vehicle sales, it would appear we are at a crest in the cycle and could soon be seeing an economic contraction that may be exacerbated by: emerging alternatives to vehicle ownership such as ride-sharing, car-sharing, carpooling, improved public transit, urban cycling and telecommuting; and changing shopper demographics, particularly the rise of millennials — who are currently frustrated with the dealership experience and are used to the convenience of online shopping — as the largest generation in the U.S. labor force. While the automotive industry is currently strong, dealerships may eventually be faced with increasingly compressed margins coupled with an automotive marketplace of fewer potential purchasers who have more particular preferences. Those that invest in optimizing their wholesale-to-retail processes while times are good will be in a position to gain market share when times get tough. 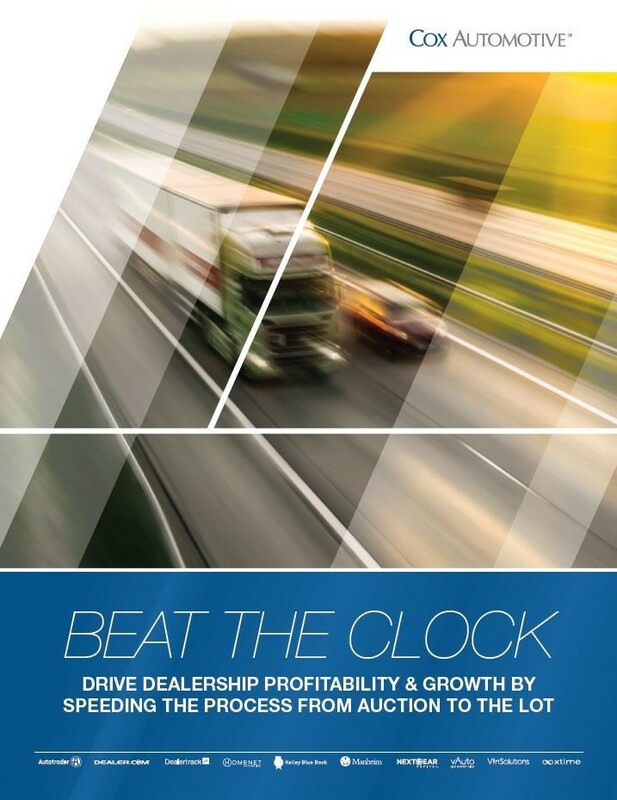 See the full white paper for tips on how dealers can increase overall operational profitability.